well maybe it is since i just typed it? 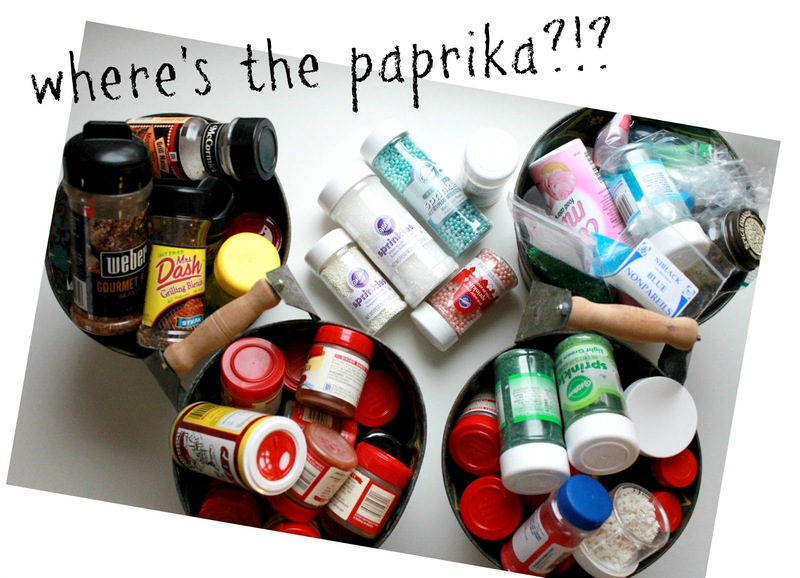 what's the best place for spices in your kitchen? then our time together will be spent more ...well ... together! oh! and my craft room feature in Better Homes & Gardens comes out in 10 days!! look for me on the I Did It! page on the inside back cover! a more detailed tour of the room will hopefully be published in one of the BHG special interest magazines sometime this year! can you believe it?? in 2 BHG magazines?? the 36th Avenue ♥ Party Time! I love this! Such a good idea. Oh my gosh, can't tell you how many times I have to dig above the stove for my spices (worst possible place to store them, but it is what it is). This is a genius idea! Love it and so cute! I'm literally jumping up and down with joy right now! I have a ton of those little jars (don't ask, a FAILED attempt at edible teacher gifts) and I thought "these would be super cute for spices". I even wanted to do chalkboard tops, but I only had chalkboard PAINT. I didn't even realize they made spray. LOVE LOVE LOVE IT! So pretty and organized. 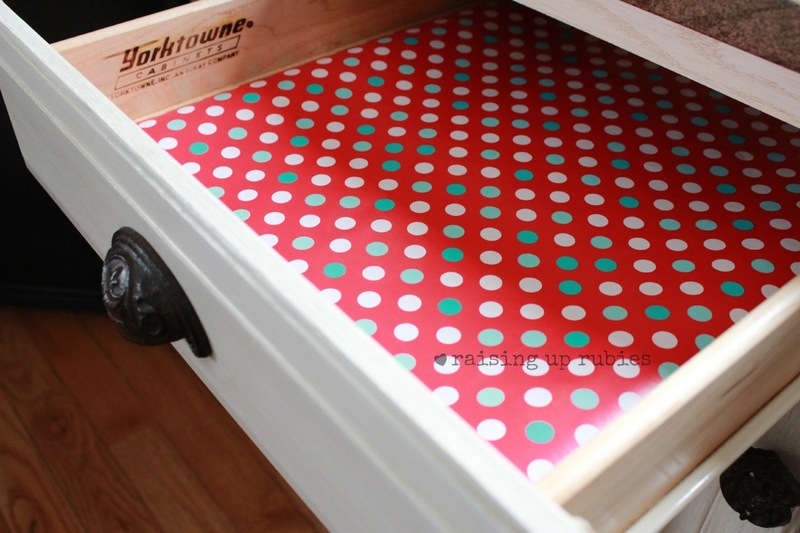 Love the idea of using wrapping paper in the drawers. Do you just lay it in there or did you tape it down or anything?? So cute and so organized (two of my favorite things!)! Thanks for sharing your great idea. I hate having all the different spice jars anyway, I like having everything in the same container. Your drawer would make me happy every time I'd open it. And I love your handwriting! I'd have to borrow that :). Thanks again for sharing! It's been pinned! Have a great day! This is so cute! Thanks for the inspiration. I buy my spices in bulk and store then in the small canning jars and also buttons, laces, other items I sew with - where would we be without these jars. I've been looking for a new way to label them and was gearing up for the chalk way. Where did you get the pen? Great ideas and if I had an empty drawer I would do the same - or wait - maybe I need to empty one of my 2 kitchen drawers for this! Thanks for enhancing my thoughts. This is a good idea! Cause my spices are a mess! AND so are the kitchen drawers. Great post and wonderful idea. I may be a copycat and do this one too! Sadly your disorganization doesn't seem disorganized to me J. I think you might faint if you saw my pantry right now, altho I did throw out the kid's halloween candy yesterday. Congratulations on the magazine features! That is truly wonderful!! Have a wonderful day! And thank you for being such an inspiration to us all! I love those measuring spoons! Where did you find them? I love the measuring spoons, as well. Please, tell us where did you get them? Thanks. That is just about the cutest thing I have ever seen. What a great idea! Thanks for sharing. Wow! I love this idea! I love the wrapping paper to line your drawer with! Thanks for sharing. 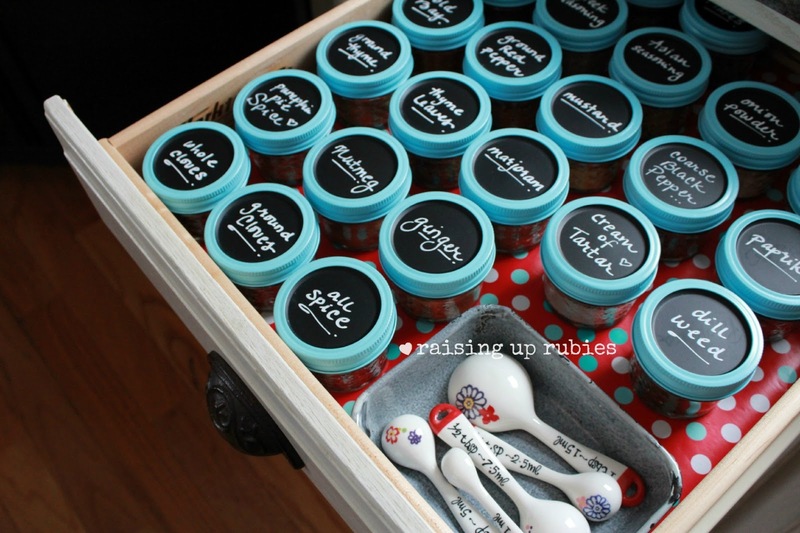 Great idea and it makes such a neat and pretty drawer, too! This will be a warm weather project! Oh how FUN! I am a spice addict. My spices are in glass jars, but in varying sizes in several square baskets. 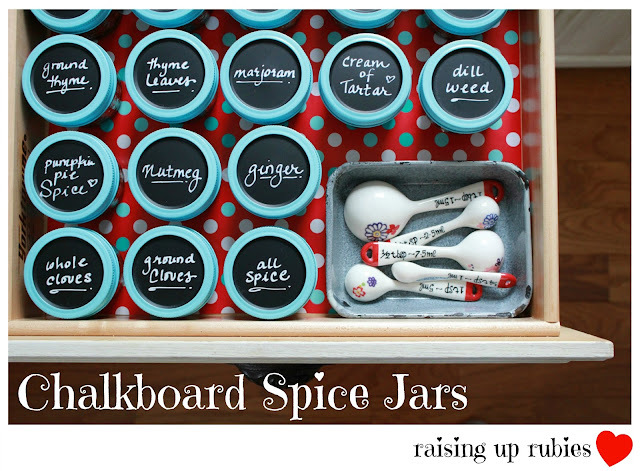 Using the same sized jars in a drawer would be fabulous! I love the chalk board tops and blue rims. Yay! Thanks oodles for the inspiration. Great idea and love the colour combos. 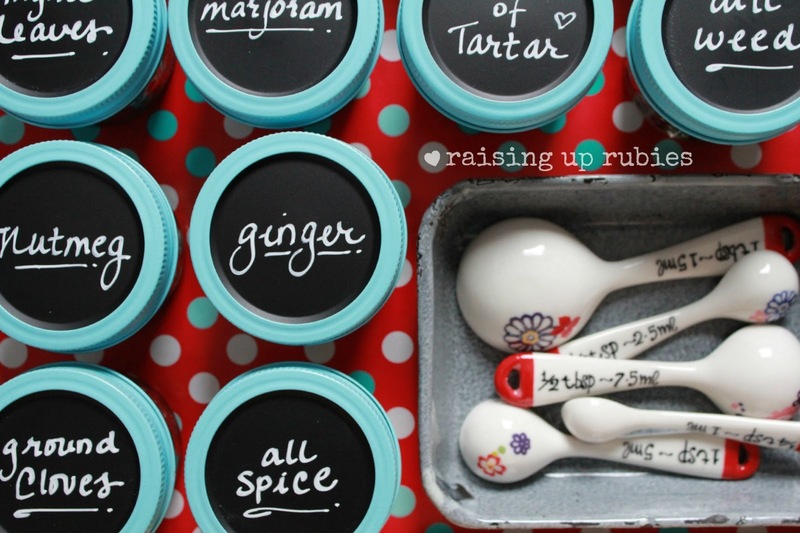 I organized my spices in jars last year but, I never would have painted the lid! You are brilliant!! love it. I am short on drawer space though. Maybe I could find some metal jars, paint them & add magnets to the bottom. Hang them inside a cabinet door? You are such a rock star! I'll be looking for yo in BHG! I just read and reviewed your refrigerator post and now I'm dumb founded how awesome your spices are organized! but I don't want to create more work for myself in the long run. Where did you find your measuring spoons? So cute! I wish I had enought drawer space to store spices that way! Where did you purchase the chalk marker? LOVE. LOV, LOVE the colors!! Well aren't you just full of cute ideas - this is adorable! 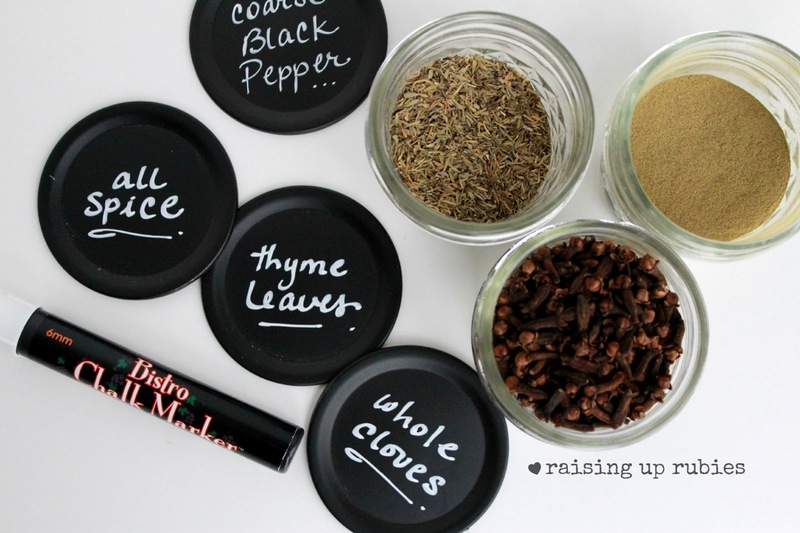 Love how you updated all the spice jars!!! Adorable. All I need is a spare drawer! BRILLIANT!!! Where do you get the Bistro chalks? I've looked everywhere!!! This is FABULOUS! I absolutely love it! Such ab great way to stay organised in the kitchen! Oh and those measuring spoons - so cute! Love it! Pinning and following :) Hope you have a great day! Jaime! I just adore your blog! I love your beautiful and crafty ideas. This is just my favorite drawer!! I think the paper just MAKES it that much better! You have great style. I just love these little spice jars. I hope to do something similar here soon as I finish up my kitchen. 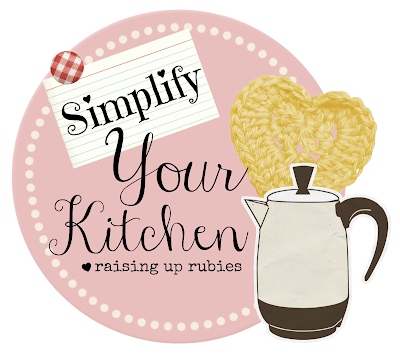 I am hosting my very first link party and would love it if you could link up. OMG! I LOVE this idea!!! I really like how fun the colors are!!! 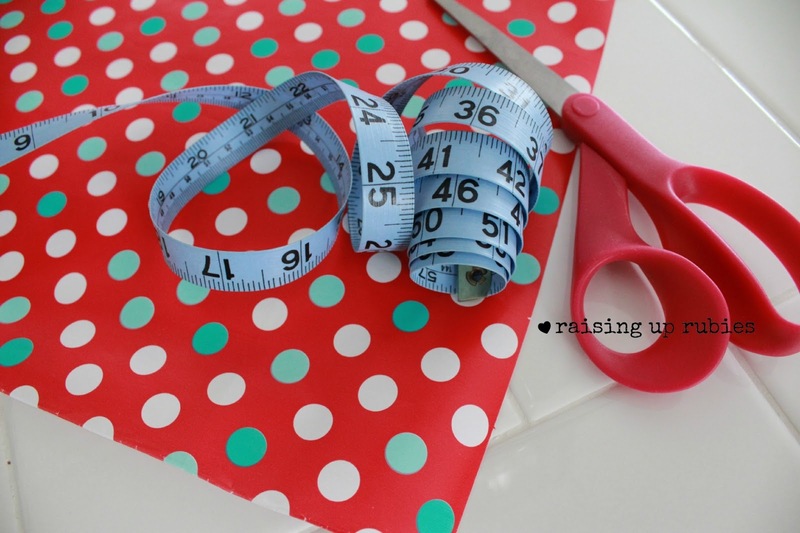 And, the polka dot paper!! LOVE! LOVE! LOVE!!! This turned out beautifully! And, I have the same measuring spoons! Also, I host and "oldies" link party on Tuesdays--a way to get come traffic out of our awesome, but old projects we posted long ago. Hope to see you there--and excited to be following you via rss. Where can I find a chalk board marker? Do you tape/glue the wrapping paper to the drawer? I love this! I have been struggling for years now with what to do with my spices. I just recently emptied a drawer in my kitchen and was wondering what to use it for! When you line the drawers with wrapping paper do you tape them down or just lay them in there flat? If you lay them in there flat, do they ever get bunched up? Jamie, they look like 1/2 pint jars, is that what you meant to say? Hi Cindy! yes! they are 1/2 pint jars... need to correct that mistake in my post :) thanks for pointing that out! off to find a drawer for my spices. Where did you get those cute spoons? That is cute as ever! I love this. I always put mine in alphabetical order too. I have looked high and low for the wrapping paper, I love it so much! Any suggestions that I might have overlooked as to where to find? I think this is so cute. I have a question about the lids. Did you attach the lids to to the rings, or do you just pop them off when you open each one? I use some Ball jars around the house for odds and ends, and that's the only thing that annoys me sometimes, having to pop the lids off. I attempted these…and was fairly successful! It's quite possibly the first project I actually completed haha I only did 6 but they look so much cuter in my cabinets than those plastic spice containers! I was wondering, would priming the metal parts of the lids make them feel not so…strange? I have a blog too, but I'm not even going to link it yet because I just got started and I don't have anything for anyone to read yet! disarray, I'm going to do this for her for a Christmas gift. Thank you so much. Working on this project now and running into a problem. Maybe someone can help/ has advice/feedback? I ran into the same problem. The chalkboard paint and the paint on the lids is flaking off. I was wondering if you primed or sanded the lids in order for the paint to have staying power? What a great idea and site! Just landed here from a link on Country Living. 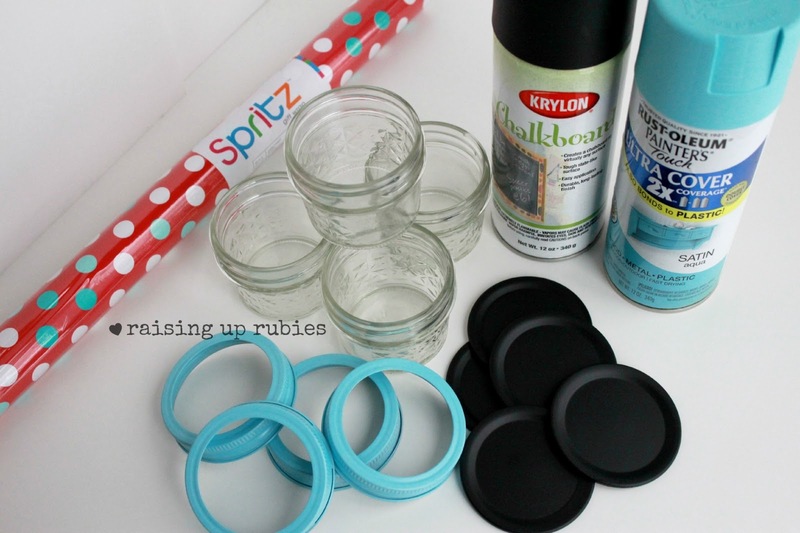 After cleaning out the junk drawer in my kitchen, I'll prime the lids on 4-ounce canning jars with Rust-Oleum metal primer before spraying with chalkboard paint. 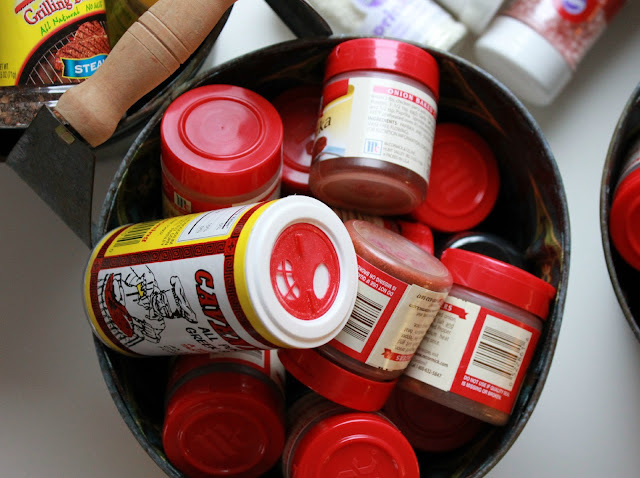 Being a creature of habit, I'll keep my "usual" seasonings in the cupboard next to the stove and dedicate the drawer to baking, canning, and seldom-used spices. What a wonderful way to clear up an essential kitchen cabinet cluttered with too much stuff. Thank you so much!!! I just found this and I'm in love! What a great idea. Off to scour the rest of your blog! I did this project and the spray paint on the lids started chipping pretty soon after. I was worried that the bits of spray paint would start getting into the spices and I didn't want to eat paint, so I ended up having to switch all my containers and now I have 30 mason jars that I need to repurpose. Any tips for getting the spray paint to stick?